Description Of Item: Remember, remember the 5th of November! From the smash hit film comes this fully poseable 12-inch tall figure of V. The figure features ball jointed neck, shoulders, wrists, torso and hips. 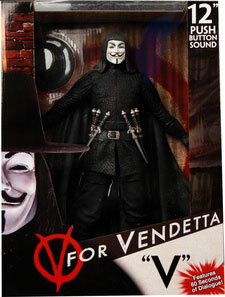 The highly detailed and movie accurate V also comes with his daggers and cape. V speaks almost 1 minute of authentic movie dialogue.